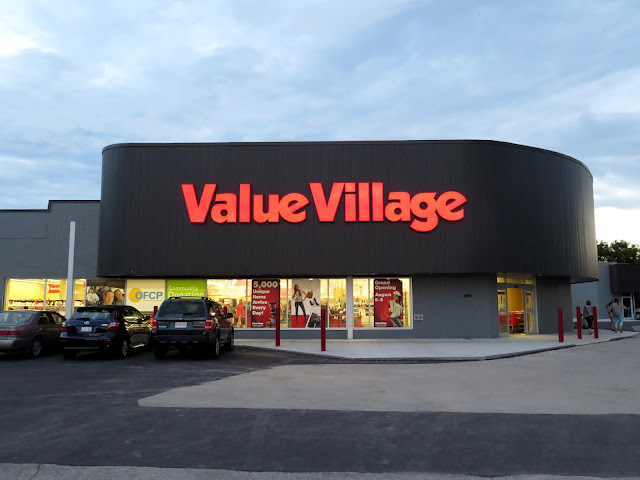 A couple of weeks ago I received an email from a media contact for Value Village, inviting me to a "Preview Event" of the re-opening of one of their stores here in London, Ontario. The east end store that I frequent was moving to a larger location right across the street from its current location, and they were having a special shopping night for invited guests before it opened to the public on August 6th. The best part was that they offered me a $50 gift certificate to shop with, and as I love shopping with other people's money, I accepted the invitation. Value Village is a for-profit thrift retailer selling used clothing, accessories and household items, with over 330 stores across Canada, the United States and Australia. The first store was opened in San Francisco, CA in 1954, and the company came to Canada in 1980. A number of non-profit organizations, (including the Canadian Diabetes Association which is my charity of choice for my clothing donations), benefit by selling donated goods to Value Village, and unsold items are recycled and sent to developing countries. I've been shopping at Value Village for many years, and have scored some great things there, but had been cutting back on the frequency of my visits, mainly for two reasons: the prices had increased quite significantly over the last few years, particularly on items from "Fast Fashion" retailers, and there were fewer vintage items to be found. I was told the store tries to price items between 10% and 30% of the original selling price, which sounds reasonable, especially for higher quality designer items. However, when I see used dresses from The Gap, H & M and Joe Fresh priced at $18.99, I think it is highly unlikely they were retail priced at over $60. When you can pick up a new Joe Fresh dress for $25 - $30, and The Gap has regular sales of 40% off, why would you pay almost $20 for a used one? I forgot to take a photo of the store when I arrived around 6:30 pm, so this one was taken around 8:30 pm when I left, and it was getting dark. The exterior is sleeker and more modern-looking than that of the old store, and the interior is larger. The new address is 1553 Dundas Street. I wasn't sure how many other people would be there as I had no idea who else had been invited, but as it turns out, there were a large number of other shoppers who were "Club Card Members" so I had some competition. I didn't take a photo of the inside of the store, but it looked very similar to every other Value Village I've visited. Unfortunately, this is my least favourite time of the year to shop at the store, as at least 1/3 of the floor space is taken up by Halloween costumes and accessories. That said, I did grab one of these Dia de Los Muertos ceramic skulls from the Halloween section to decorate my desk at work. I spied this vintage doll in the housewares section and immediately thought of my friend Krista, who has a few of these in her collection. If her outfit has been more interesting I may have taken her home, but as it was, I left her on the shelf. I like Mexican pottery and this candle holder caught my attention for a moment, but it wasn't as nice as pieces I already own. 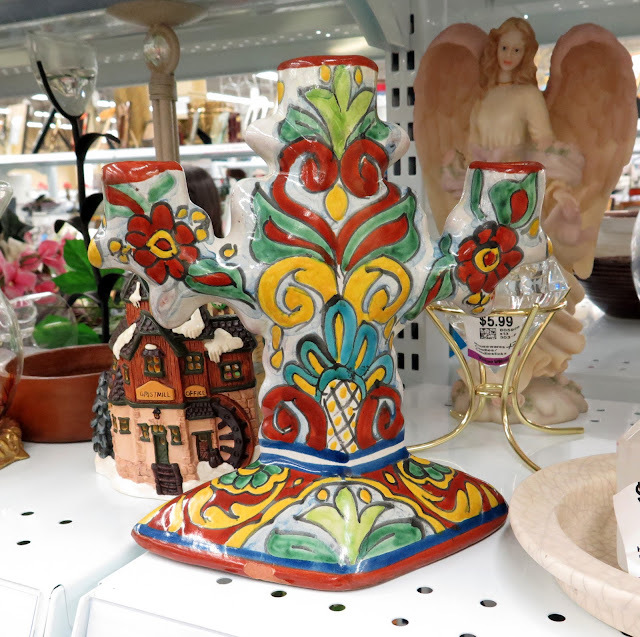 I have no real strategy when shopping in large thrift stores, although I tend to look at the housewares section first, and then veer off to the coats, dresses, and skirts. I throw everything that looks like it may have potential in the cart, and then weed out the "No's" in the change room. Mindful of my $50 budget, there were a few things I liked, but didn't love, that went back out onto the racks. 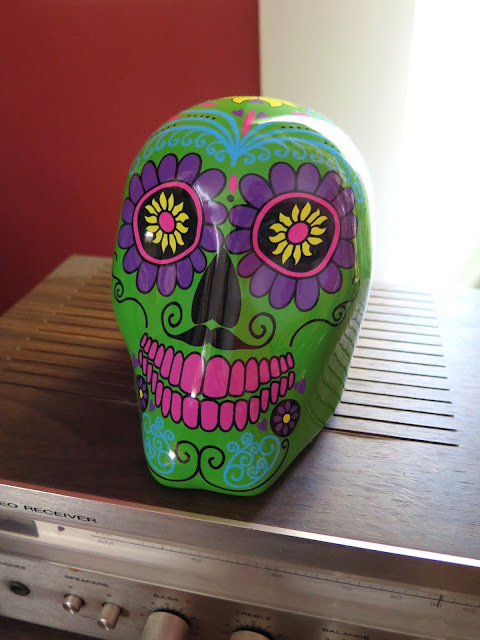 In the end I came home with five items, including the ceramic skull, averaging out to $10 per item. 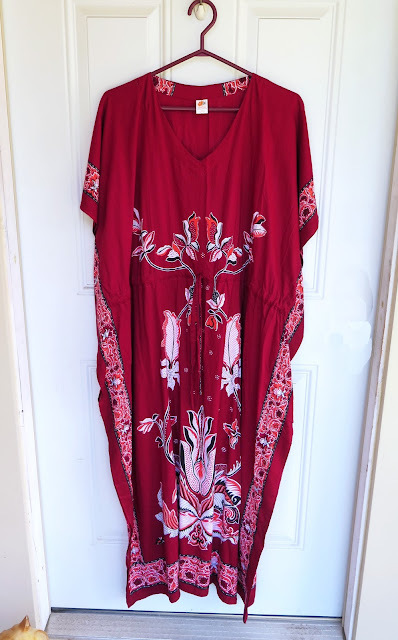 I waffled over this Made-in-Thailand Kaftan style dress - I loved the colours, and the drawstring gave it some shape but I questioned whether I really needed another long summer dress. Of course, we avid thrift shoppers know that most of our purchases are more about "want" than "need", and after wearing it out of the changing room a few times to hang up unwanted items, I decided to take it. 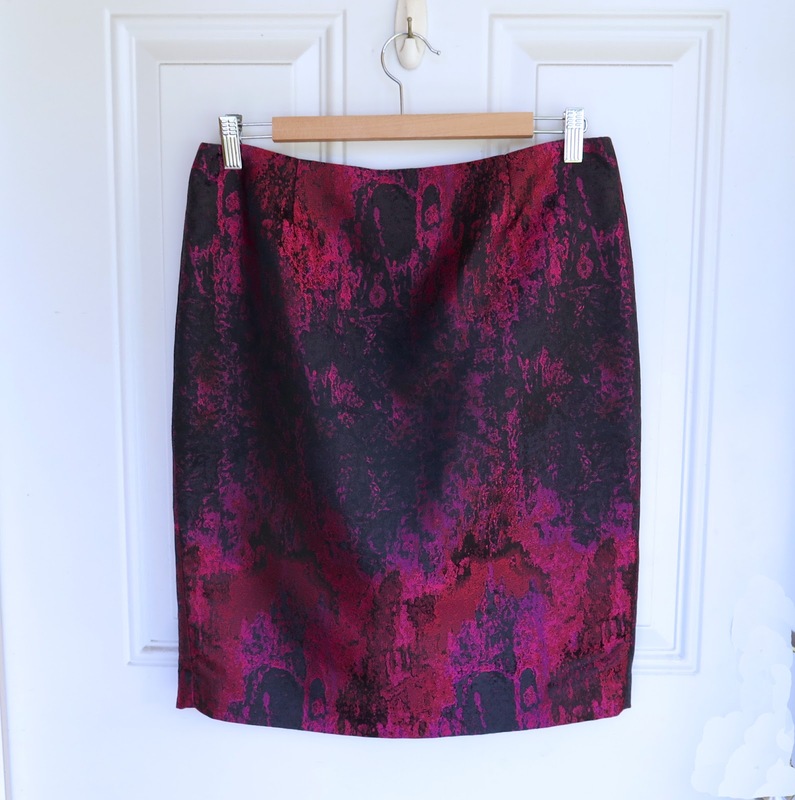 Thinking ahead to fall, I picked up this pencil skirt to wear with tights and boots. The fabric has a bit of a sheen to it, and I loved the fab colours. 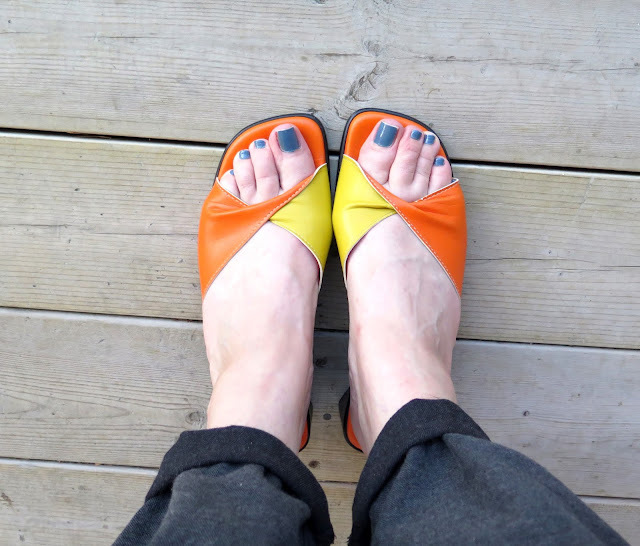 Even though we are nearing the end of Summer, I scooped up these wedge heeled sandals because of the juicy colours and the bunion-hiding twist of soft leather. I have been wearing them around the house today and they are pretty comfortable. 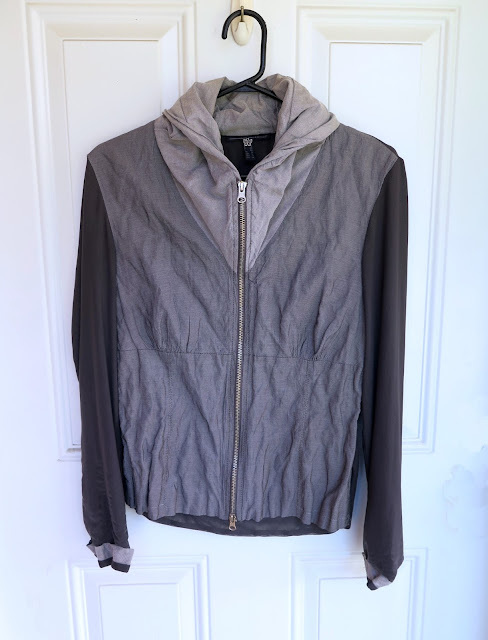 My final purchase was this jacket by the German brand Kapalua. I wasn't familiar with the brand, but I was attracted to the unique styling of the jacket. The back and the sleeves are made of chiffon, and the collar changes shape depending on how far you do up the zipper. This is the kind of piece I would purchase retail - modern, well made, with a simple shape and unusual details. Many thanks to Value Village for the shopping trip - it was fun, and I found some things that I will happily integrate into my wardrobe. Great finds, Shelley, and a great write-up. Nothing like getting paid to go shopping - hurrah! And the floors and change rooms would have been really, really clean, and the stock would be orderly. I'm glad you got the VIP treatment. The dusk photo looks very arty. Ooh, I love that pencil skirt and that hoodie - great eye for the unusual, Shelley! What fun you got a $50 gift certificate! Funny how with the kaftan we are always attracted to the same type of items. I can see this would look wonderful on you. Can't wait till you model it. I love this place. I had an event here back in May last year and I felt like it was a perfect day for us! The Los Angeles event venues provides you with an event Specialist as part of your package which is extremely helpful. Plus all of us dressed up only added to the entire ambience. can i say WOW. this looks like heaven. there would never be a thrift shop[ that size in ireland. Love the skirt! I like shopping during the Halloween season because a lot of thrifts mix vintage into their "costume" racks. I have found Value Village to be relatively pricey compared with some other places I go, though. It's great you got 50.00 to shop with! Wow, an invitation to a thrift store opening with a gift certificate! Tell me that doesn't happen every day. 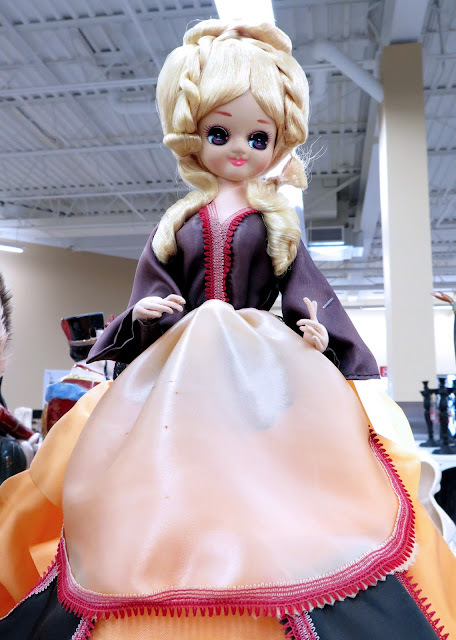 I've even been in a Value Village before and found it pretty trashy/ creepy. Who knew they actually built new ones! I don't recall there every being changing rooms, shudder. But anyway that was a long time ago and in Chicago. Canada is cleaner and nicer, I'm sure. Meanwhile, you got some cool stuff. My fav is the kaftan, of course. But everything is way cool. Well done. You got some good stuff. I especially like the caftan and those shoes - citrusy goodness! Lucky you, getting a gift certificate and an early bird preview! Looks like the $50 gift certificate was well spent! But then you're a seasoned thrifter, and only go for the very best. I love the colorful sandals and the pencil skirt! We have a Value Village in Denver, but I haven't checked it out for several years. You've motivated me to give it a try the next time I drive by. Great review to accompany your eye for the detailed, cool and unusual. Free shopping? hell yes! Loving the kaftan and the sandals especially. Krista and I both love those Bradley dolls but you're right, the outfit wasn't very inspiring. Great post. Loved the shoes! I hear ya about VV's prices. I don't shop there much any more b/c they are too $$ but congrats on the deals you got! Such a great opportunity: there's nothing like Value Vintage in my neck of the woods!, so even if it's not cheap and it's almost selling shabby fast fashion clothes, it's very interesting! Of course, any discount or gift certificate is fabulous and you made some great purchases, lovely caftan, colorful sandals and a cool shaped jacket!, really wonderful!